Cover: This is one of the most intriguing covers I’ve come across in a long while. What on earth could this story possibly be about? All I can think of here is Hotel Hell. Although I did get another entry for my dictionary of future slang! In another in media res opening, the Mad Dogs are gunning down a bunch of Volgs guarding a food supply truck. With the supplies in their hands, the Dogs then drive around the ctiy, handing out food to starving Londoners! Sick of all the resistance’s successes, the commander of the Volgan occupation forces summons a specialist to his office. The man’s name is Spode, a former member of the Flying Squad (an elite specialst division inside the police department) who’s switched teams and now works for the Volgs! He knows how to track men through London better than anyone, and now he’s hunting Savage! Which proved to be incredibly easy. He beats up two guys and the second one points them at Savage’s hideout on the Isle of Dogs. Which is what Savage gets for trying to take over an entire island in the middle of occupied London. While the second man is being beaten up a mechanic happens to overhear Spode’s plans, and runs to Savage, hoping to warn him. The mechanic gets there, but just in time – the Volgs arrive just minutes later with tanks and cannons! Things look incredibly bad for Savage, but then he comes up with a miraculous plan – he has the mechanic tune up the two Volgan sports cars they’d stolen the week before while the Dogs hold the tanks at bay with bazookas. The Volgs think they have savage cornered, but then the doors of the warhouse smash open as Savage drives a tractor-trailer rig up a ramp so that it lands atop one of the tanks! Then the back doors fly open, and Savage drives out the back in one of the sports cars, followed by the mechanic in another. Now they just have to make it by Spode and his anti-tank gun! The mechanic decides to take the noble hero’s route after he catches a bullet, and drives his car full-speed into the tank gun, killing spode and the crew! The Mad Dogs drive away from the scene – thankfully the Volgans didn’t think to prepare air support – and ponder their failure. They had to leave half their men dead back at the base! Isn’t this like the third time Savage has lost ‘half (his) men’? Well, according to Zeno’s paradox even if he keeps losing half his men indefinitely, he’ll never run out of troops, so that’s something to look forward to. It seems that London is too dangerous, and they’re going to have to take their act on the road. The story two weeks ago suggested that there were already Resistance Cells all over the country, but I’m sure they’ll be happy to have the Mad Dogs around to help, right? Also, and I’m only going to list it this week, in case the art switches, but I found a credit between one of the panels this week – apparently the strip is drawn by one Carlos Pino! At the Trans-Time grid the guards quickly move to shoot down the dinosaurs who made it through the time jump, along with the tri-man-headedsaurus. Now it’s just time to wrap things up. Earl is taken away in shackles – as the last surviving management official from the base, he’s going to be punished for its destruction. Unsurprisingly the FC wasn’t sending Earl’s messages of impending doom forward in time. You know, in retrospect the better play might have been for Earl to travel into the future the second he got back. That way he could take all the time he needed convincing the executives in the future to send reinforcements back, or call a general evacuation. Or could he have? I’m still not entirely clear on how their time travel works. Whatever happened to Old One-Eye, Queen of the Dinosaurs? He lets Giant hear his voice, which proves just distracting enough that he allows the ball to hit his shoulder, knocking him back. This makes Artie’s calw miss as well, slamming into another Gargoyle, who was rushing to grab the ball. Horribly damaged, the Garg slams into the ground, too damaged to return to the game. Once the stoppage is over the Gargs get the ball, and one of them gives it a severe kick at the goal post. Never one to miss an opportunity, Artie shoves Chico in front of the ball’s path. 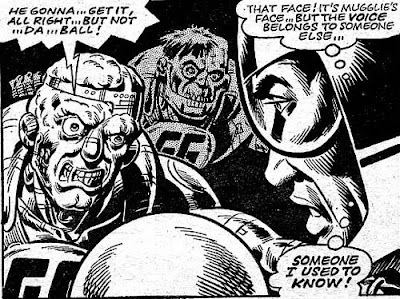 The ball slams into his face and knocks him into the post, where he’s electrocuted! You know, I’ve forgotten why that goal post has fatal level of electricity running through it. Was there a reason for that? So, anyway, Chico’s dead. You know, when I predicted that the two least important characters to get names wouldn’t get more than ten lines between them, it never occurred to me that those same character would both wind up being cannon fodder. Sammy’s out for life and Chico’s dead. I’m going to miss those mute bastards. Even with one player dead and another possibly permenantly out of service the game goes on. This time with a difference! Artie grabs the ball, attaches a bomb to it, and throws a ‘botched’ pass, right at Giant! In an attempt to escape the Mekon and his nefarious sidekick(s?) the Two of Verath, Dan and Rok jumped down a chasm. This proves to be less suicidal than one would normally assume, as the hollow planet is being held together by an artificial force field, which Dan somehow guessed. Great instincts on that guy. Unfortunately the Two know this as well, and jump down after him. Of course, despite the name, the two-headed guy is technically only one guy, physically speaking, so Dan and Rok prove more than a match. Especially considering Rok’s (it’s certainly not a) lightsaber. The three (four?) of them head over to the Mekon’s ship, which Dan plans to use to escape. They could easily be gunned down on the way, but the Mekon demands that they not fire. For some reason the Two is (are?) vital to his plans. The Two pushes Rok off, and fires on the ship as Dan and Rok fly away. Annoyed by this failure, the Mekon orders all gun-headed monsters to stop the ship at any costs… with death as the punishment for failure! The Two finally get around to questioning whether the Mekon should be running things, which causes the Mekon to respond in a wholly stable fashion: A mind-control ray. Actually, it may not be meant to ‘control’ anything. They ask to know his plans, and he zaps them with a ray, announcing that they’ll ‘learn of them right now!’ So it’s possible that he keeps some kind of an educational control thing in his chair. 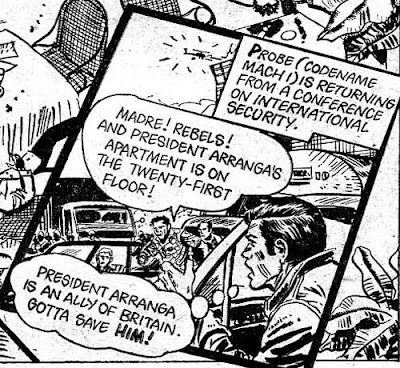 Again the action starts immediately in MACH 1 – John Probe is attending a conference in South America when Rebels atttck a nearby hotel, as we learn from this panel where the dialogue bubbles are skewed for no clear reason. That’s right. If it didn’t serve Britain’s international interests, Probe would be totally cool with the murderous rebels and their blood-spattered coup. Probe runs across the top of a traffic jam, then uses the ladder of a fire truck to make a quick entrance to the building – the main entrance is blocked by terrorists, including a german with a flamethrower! Ah, that computer in his brain, always with the dry commentary on his brutal actions. If that weren’t action enough for one episode, after checking to make sure El Presidente’s door hasn’t been breached Probe runs to the roof, guns down the remaining attackers, then detonates a flammable oil tank to destroy their attack helicopter! That’s right, he got into a little man-vs-helicopter action. How can you not love that? Now the only threat left to deal with are the soliders on the first floor. Probe slides down the elevator cable, servely burning his hands on the way to the ground floor. But those burns are nothing compared to the ones received by the ‘kraut’ terrorist when Probe shoots his flamethrower’s fuel tank! It explodes, killing all the remaining terrorists. You know he’s laying just over there, right? I mean, isn’t ‘gringo’ a pretty nasty ethnic slur? If one of your men had saved the Prime Minister’s life in an attack on number 10, do you think he’d publicly call the guy a ‘Wog’? It’s also nice that, despite the slur, John Probe can take the time to condescend to the president within his own mind. Okay, finally we’re going to find out what was happening on that cover! It seems that ‘Brainblooms’ are all the rage in the Big Meg. 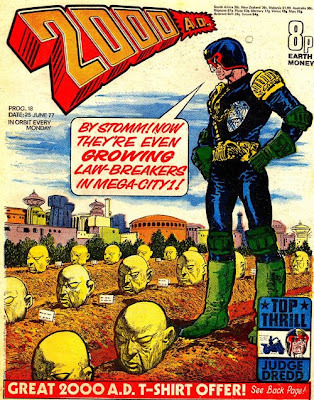 They’re so popular that Maria, Dredd’s landlady, has bought him one for his birthday! Which was a crime, actually. It seems that the Brainblooms are the producting of bio-organic inter-species grafting, and they’re illegal because of ‘what they’re fed on’. Dredd neglects to mention what that foodstuff is, although I assume we’ll learn later in a ‘Soylent Green is people!’ moment. 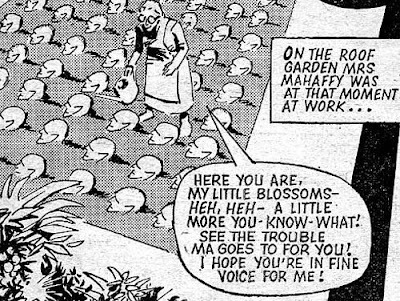 Again proving uncharacteristically lenient, Dredd thinks to himself that he doesn’t care about the shops that sell the blooms or the customers that buy them – he wants the mad gardener responsible for these abominations! Dredd’s plan of beating up and arresting an old lady doesn’t go quite according to plan, since she’s trained her brainblooms to hum a hypnotic tune! Incapacitated by his trance, Dredd radios in that the old lady was a false lead, and then heads off to crash his bike into a lorry. The truck driver to have absolutely stunning reflexes, and manages to swerve far enough to the side that Dredd is dealt only a glancing blow. 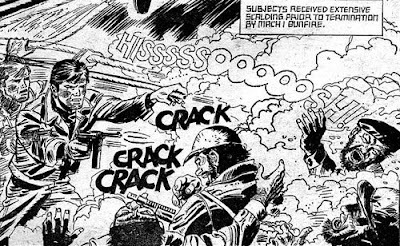 The resluting crash isn’t fatal enough to stop Dredd, but it’s certainly violent enough to pull him out of his trance! Then it’s back to the rooftop where garden, but with backup this time! 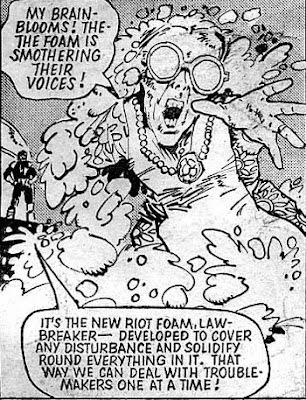 Dredd has the riot squad douse the entire place in riot foam, deadening the hypnotic voices of the blooms. Also, and I hate to have to admit this, that’s that end of the comic. The secret ingredient to making Brainblooms was never revealed. It was omniously set up, then nastily teased, but there was no reveal at the end. So I’m just going to take a guess. To grow brainblooms you need… the crebral cortexes of 1-week-old babies. There. Now we know why they’re illegal. And no wonder it was such an ordeal for Ma Mahaffey to get ahold of them! Okay, it was probably just blood, although for the life of me I don’t know why they wouldn’t be able to say that in a comic. Best Story: We have a rare tie for the best episode this week. Between the incredibly satisfying (almost) wrap-up of Flesh and the wonderful action of MACH 1, it’s impossible to pick which one of these stories was actually the best. I would've split three ways with Judge Dredd hat the story offered an explanation of the brainblooms’ diet. Worst story: Despite my disappointment with that Judge Dredd tale I can't name a worst story this week. Between someone getting killed off in Harlem heroes, and the story progression in Dan Dare, it was a satisfying overall issue. 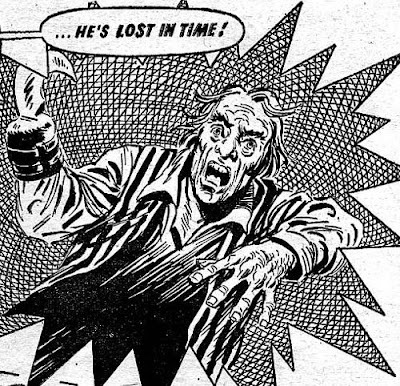 Even if the INVASION story, which involved introducing a new character solely so they can sacrifice their life saving Bill Savage and the Mad Dogs moments later, was a little by the numbers, at least the overall story moved forward, finally getting the Mad Dogs out of their preposterous up hideout on the Isle of Dogs.